GETTING THERE FROM HERE-One of the most interesting things about planning Metro light rail lines is the need to have the names of their stations emphasize a sense of place, and a sense of community, both to local neighbors who value community identity and to far-flung commuters and tourists who just want to know where the heck they are. So ... guess what, folks--it's NAMING time! 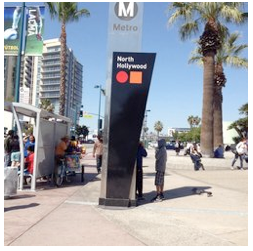 1) Unbeknownst to most of us, there is an effort underfoot on the Metro Board to rename the North Hollywood Red Line Station to the North Hollywood/Zev Yaroslavsky Station, and to rename the East LA Civic Center Station to the East LA Civic Center/Gloria Molina Station. 2) Also unbeknownst to most of us, the Metro Crenshaw/LAX Light Rail Line Project is requesting public and community input to name its new stations. 3) Whether hard-working citizens, fighting to keep up with work and family obligations, can keep up with this naming issue, and/or are they being properly informed of this sort of endeavor. Naming a station, or naming a line, is more than just a conceit or fetish--it allows community buy-in for a light rail or subway line that will exist for generations, and has considerable economic and even traffic impacts as commuters and tourists opt to (or not opt to) use rail lines. To some of us, the question of "what's in a name?" is a silly endeavor. After all, the segments of the I-10, I-405, I-105, SR-91, SR-60 etc. can be named after a police officer, or a civil rights advocate, or an American president, but most of us just call it by a number to reference a way to get from one point to another. But the naming does have some considerable significance for those planning and using transit lines. The history of Metro's Red and Gold Lines suggests that Zev Yaroslavsky did fight for the Red Line and then shut down further subway spending, including an East L.A. Red Line subway extension (to the undying fury of Gloria Molina, who saw the Gold Line Light Rail Line as a sad and pathetic consolation prize). 1) The willy-nilly Metro Board fiats and spending and political infighting of the 1990's cost us big, when we should have focused on a few projects with defined destinations and favorable cost-benefit ratios. 2) Hiring good contractors, and both rewarding and punishing contractors appropriately, has its role on the Metro Board and the staff who works for the Board. 1) Zev Yaroslavsky (who helped double the Red Line Subway ridership after fighting for a Red Line extension to Universal City and North Hollywood, and who shut down the crazy spending and then fought for the two well-defined Expo and Purple/Wilshire Lines after they were vetted) might indeed deserve a station named after him. 2) Gloria Molina (who was combative, not visionary, when it came to the Eastside Gold Line and the Downtown Light Rail Connector, and who fought the Measure R that paid for both of them, because she never forgave Yaroslavsky and the rest of the Metro Board for not creating an Eastside Red Line Subway) is merely "Exhibit A" for term limits, and is being suggested for a station name out of political consideration and balance. Count me in as someone who prefers to name a station after a beloved community figure (like former and iconic Laker commentator Chick Hearn, or former and political gamechanger LA mayor Tom Bradley), rather than a politician who is alive and well and likely already has too big of an ego. The question of what to name the Metro Crenshaw/LAX Line stations in Westchester and LAX is one that is more relevant, and one that particularly needed to be addressed in light of the lack of attention paid to Westside, LAX and South Bay residents and commuters with respect to the line that will be going through their regions. After all, the Crenshaw/LAX line has two parts to its name...and only the first part has received sufficient focus by Metro and by political leaders. Hopefully, the recent efforts by the CD11 Transportation Committee, which met last week to address this line (and was chaired by its new co-chair--Westchester resident, regular transit rider and occasional CityWatch contributor Matthew Hetz). 1) The station at Hindry near Florence, after over 20 names were submitted by the community, had a favored station name of "Hindry/Westchester" to reflect both the location and the inclusion/access of Westchester into this line. 2) The station at 96th/Aviation, where the Metro Crenshaw/LAX Line will connect with the LAX People Mover, had a favored station name of "Metro/LAX Transit Center" to clarify its role for commuters and tourists. 3) The station at Century/Aviation had a favored station name of "Century/Aviation". To repeat and summarize, the station names to be submitted to Metro, with helpful and friendly Metro representative Brett Roberts in attendance, are "Hindry/Westchester", "Metro/LAX Transit Center" and "Century/Aviation".